We all know that fruits are amongst the healthiest of foods, but this food group is usually consumed raw, or had in the form of juices and salads. 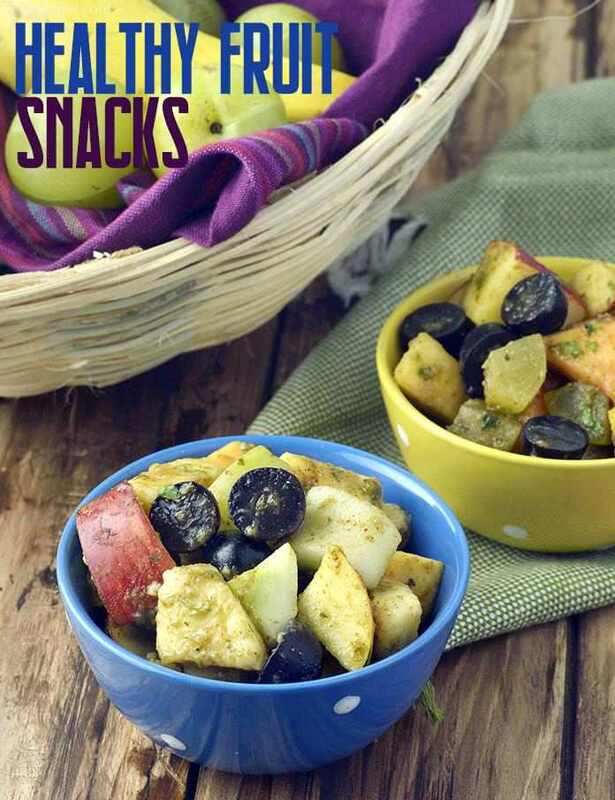 This section offers you a variety of healthy fruit snacks prepared using various kinds of fruits. These fruity snacks offer you myriad flavours, from sweetness and tanginess to tartness, promising total excitement for your taste buds. Let us not stand between you and these exciting fruit-filled snacks, which will make your daily dose of fruit a lot more interesting! We have made the traditional Appam super healthy with the Jowar and Pear Appam made with Jowar ! Guacamole Apple Bean salad is a diabetic friendly snack to have. We love the Apple Banana Date Salad which is sweetened by dates. The Minty Apple Salad is sweetened by little bit of honey and has loads of healthy apples. When fresh pears are in the market then make Pear and Pomergranate Salad. Oats are a super food and combine well with fruits. Beyond breakfast, at work tasty cold oatmeal options like Apple Banana Steel Cut Oats, Vegan Oatmeal Almond Milk with Apples are great healthy snack options. For a varaition, make Buckwheat Groats Apple Porridge. Want a quick healthy snack. Make your juices in the morning and carry them in a flask to school or work. Papaya is available year round in India and use that to make Papaya Green Apple Smoothie. Make the Carrot Apple and Beet Juice which has the color of beet and good for your heart. Use apple with the skin to make Apple Carrot drink which is good for your eyes.